Over 500m2 of Polyflor’s popular Forest fx collection of wood effect sheet vinyl flooring features prominently in Warrington Hospital’s £1 million Forget Me Not ward, opened in 2014 to create a unique care environment that encourages relaxation and stimulation for patients who need expert care and are also living with dementia. Installed by Jepsons Limited in Darwin, Forest fx’s authentic reproduction of wood styles have been laid across the hospital ward within areas such as the reception, corridors, patient meeting zones and a special quiet room to aid reminiscence; developing a homely and natural feel that patients are comfortable with. The installation features a blend of Forest fx’s lighter Oiled Oak design balanced against the stronger Rustic Oak colour to achieve a differentiation between patient meeting points and the more general walkway areas. Leading the way in providing the best quality of care for hospital patients who are living with dementia, the interior of the Forget Me Not ward is designed to look different from a typical hospital environment, using colour and light to encourage a calm atmosphere that patients feel at home with and can navigate easily, using tools that aid and encourage their reminiscence. 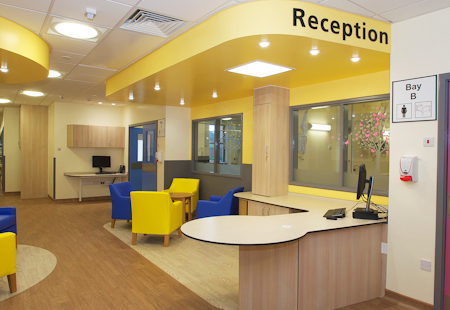 Designed with health and specialist care interiors in mind, Polyflor’s Forest fx collection offers a resilient and hygienic solution for heavy traffic commercial interiors with a series of creative timber designs that projects a homely and warming feel. To further enhance the floorcovering, Forest fx features Polyflor’s renowned high quality, cross-linked polyurethane reinforcement (PUR) providing a low cost, polish-free maintenance regime for the lifetime of the product. UK manufactured, containing recycled material and 100% recyclable via the Recofloor scheme, Forest fx PUR achieves an individually certified BRE A+ Rating (ENP 415) in major use areas such as healthcare, based on a life cycle analysis approach over a building life of 60 years.